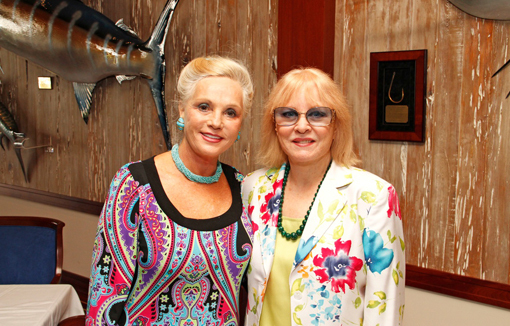 PALM BEACH, FL – Etonella Christlieb and Monica Ericksonwill serve as honorary chairs of the second annual “Portrait of a Woman” spring luncheon, benefitting Quantum House. The program, to be held March 21, 2013, at 11:30 a.m. at a private club in Palm Beach, coincides with National Women’s History Month. Renee D. Plevy, founder of the benefit, and Bobbi Shorr are chairing the event. Honorary Committee members include Edith Gelfand, Arlette Gordon and Gail Worth from Palm Beach; Shelley Cabangon and Debbie Schwartzberg from West Palm Beach; Johanna Klausen of Royal Palm Beach; Geri Morrow, from Singer Island; and Joan Rubin of Boynton Beach. The four honorees and “grand matriarch” will be announced later. Last year’s Portrait of a Woman Honorees included Dorothy Sullivan (Grand Honoree), the Countess de Hoernle (Grand Honorary Matriarch), Honorary Matriarchs Helen Babione and Suzy Minkoff, and five special honorees: Bobbi Horwich, Lynda Levitsky, Jacie Keeley, Sherry Frankel and Dr. Maria M. Vallejo. The Portrait of a Woman program recognizes its annual honorees and matriarchs through original oil portraits painted by Plevy, a portraitist, that will be displayed at leading venues throughout Palm Beach County. “This event is our way of saluting special women from throughout Palm Beach County for their major long-term contributions to our overall community, as well as to individuals, businesses, civic organizations and charities,” said Shorr. Tickets are $135, and sponsorship opportunities are available. Quantum House provides lodging for families whose children are receiving treatment in Palm Beach County for a serious medical condition. Located on the campus of The Children’s Hospital at St. Mary’s Medical Center, it is the only facility of its kind between Orlando and Fort Lauderdale. Quantum House opened in 2001 and serves 1,300 family members annually.